Present Owner: Darlingford Memorial Park Inc. The magnitude of human loss and suffering during the Great War resulted in the erection of memorial cenotaphs, statuary and tablets throughout Manitoba. In 1921 Darlingford and the surrounding district commemorated their military efforts by constructing this small Gothic-inspired memorial building and park. It is the only free-standing memorial building in Manitoba with the sole function of commemorating the war dead. Inside the memorial, two black marble tablets bear the names of the 199 local veterans and victims of World Wars I and II. The tranquil setting of the memorial and park evokes a spirit of hope and remembrance in stark contrast with the battlefields of Europe. It was the inspiration of Ferris Bolton, a pioneer farmer and politician from Darlingford, whose three sons were killed in France in 1917. The memorial was designed by Arthur A. Stoughton, the first head of the School of Architecture, University of Manitoba. 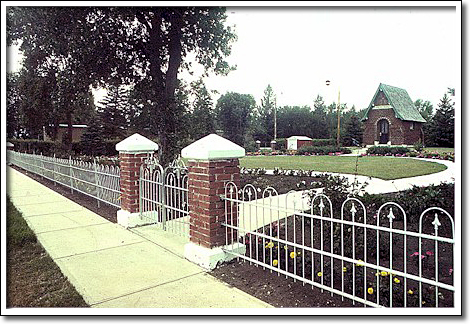 The Morden Experimental Farm designed and landscaped the park. Dr. W.R. Leslie, the Farm’s superintendent, tended the park for many years.